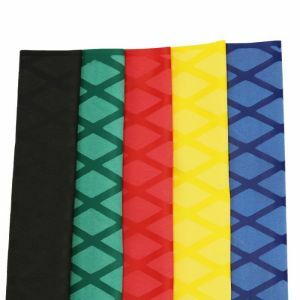 A unique mixture of Polyolefin Weft and Polyester Warp yarns woven together to form the only shrinkable fabric of its kind. Ideal for use on pipes, wire harnesses, rubber hoses, etc, heat shrinkable fabric tubing combines outstanding fluid resistance with extreme abrasion resistance. Because of its high flexibility, shrink fabric can be used on bent hoses without fear of the tubing sliding off.